Hotel Auriga in Lech doesn’t just feature a beautiful spa area – but one of the biggest spas in the entire Arlberg region. Offering 1,125 multifaceted and relaxing square metres, the spa at the spa hotel in Lech has everything you’re dreaming of in a winter holiday. From the sauna area with relaxation room, fresh air area and Kneipp course to the 20-m long lagoon pool to the perfectly equipped fitness room with Techno Gym equipment. The comfort offerings are capped off by a diverse offering of massages and spa treatments. Refresh yourself between sauna sessions with a choice selection of herbal, fruit and black teas at the bar in the spa. A spa bag for your spa visit is ready and waiting in your room: treat yourself in the exclusive spa hotel at the Arlberg! The unique, 22-m long lagoon pool is at the centre of the Auriga spa area. It is filled with only the clearest mountain water from Lech. Heated up to pleasant bathing temperatures, you’ll find the perfect option to swim and relax in the water here. Waterfall shower and floor spring create tingly massages effects from above and below, while the large panorama windows let bright daylight into the pool area. There’s a particularly comfortable lounger available to each and every single Hotel Auriga guest. Let your thoughts run free and quietly observe snowflakes dancing from the sky. Could there be anything better than drifting in the water and enjoying the feeling of weightlessness? 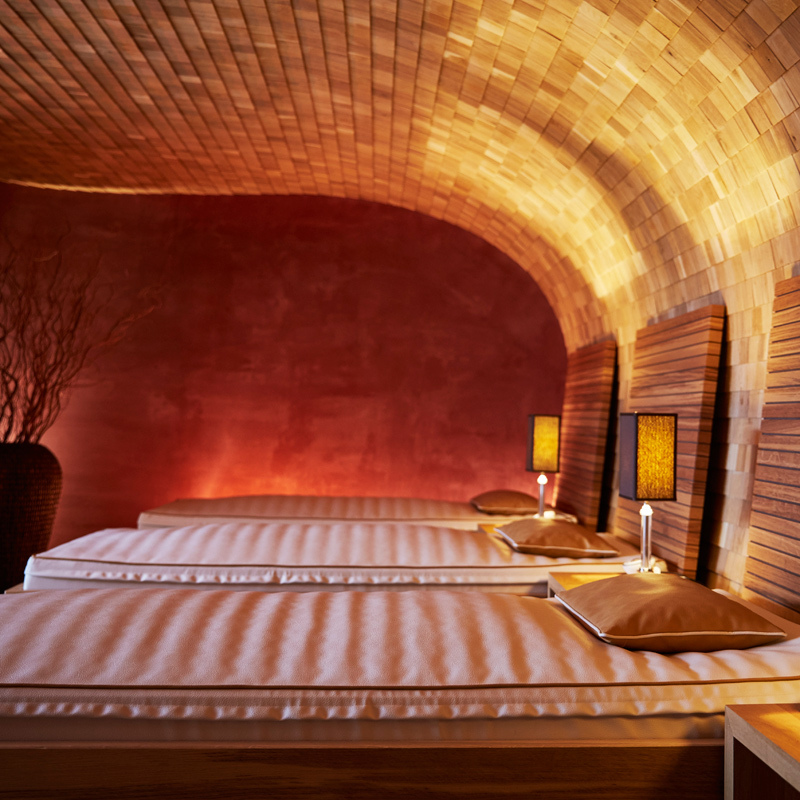 Set sufficient time aside to explore the sauna area at the spa hotel Auriga during your winter holiday in Lech. Regular sauna sessions exercise the heart, blood vessels and metabolism. They also stimulate the bloody flow and cleansing of the skin. As a side effect, the immune system gets strengthened. It’s important to adhere to the sauna rules. Shower and dry off first. Make sure that your feet are warm. Now enter the sauna and drape a towel over the seating area. Sweat depending on type of sauna and preference, and treat yourself to intensive cooling-down afterwards. After a break in the relaxation room you can go on to the next sauna session. Don’t forget to drink a lot during breaks! The classic among the sweat parlours with a temperature between 80 and 100° C. Sweat in dry air and enjoy the fragrance of wood. Infusions offer particular wellness. The milder sauna with 60° C is also perfectly suited for heat-sensitive guests. 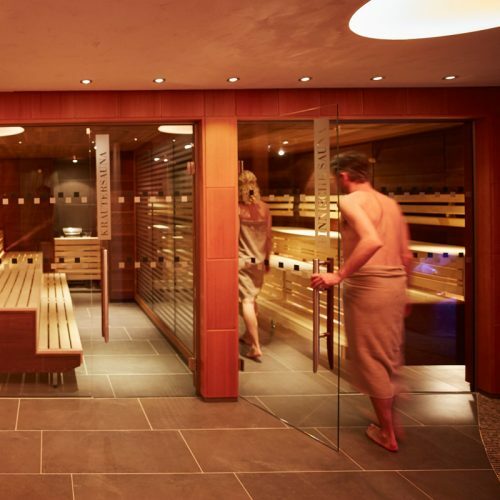 Taking this sauna is easier on the circulation, while herbal aromas make the session a particularly pleasant one. The gentle alternative for those that find the heat in the classic sauna to intense. The mild warmth and particularly high humidity of up to 100% caters to the respiratory system and the skin in particular. Already work up a sweat at low temperatures from 35 to 55° C. Finely dissolved sea salt brine is nebulised regularly, additional eucalyptus and mint extracts ensure free breathing. Enjoy circulation-friendly sweating from 30° C. Infrared rays deeply penetrate the muscles heat up and loosen them. Lymph, metabolism and circulation are stimulated gently. Refresh between sauna sessions in the ice grotto with ice waterfall, while treading water in the Kneipp course and in the fresh air area. Effectively train your circulation and immune system this way. Looking for an effective occasional workout, daily endurance training or a session of ski gymnastics? Boost your power and endurance with the aid of modern equipment by the renowned Techno Gym brand in the Auriga fitness room. Computer-supported running training, simulated mountain and valley courses, and automated pulse monitoring make training fun. Whether feet and calves are burning after skiing, the small of the back hurts again or you simply want to fully relax, the wide selection of classic and medicinal massages and spa treatments at the Auriga spa limbers you up for every single day of your Arlberg holiday and beyond.